The footballers have almost forgotten their inconsistent autumn performance after five matches in a row without loss, but they ruined everything in the finals, when they lost terribly to Liberec. Both teams had problems with their line-ups, but it was more serious for Liberec who had Kelic serving a suspension after being dismissed in the previous round, halfbacks Dockal and Liska serving time for four collective bookings, and their goalkeeper Hauzer, defender Gecov and forward Blazek were absent due to health problems. Boleslav were missing only Fabian, who was down with the flu. Originally, the first round of spring rematches took place at the end of the autumn program of the old season, similarly to previous years. This time Mlada Boleslav visited a Liberec side that had fired their experienced coach Skorpil two weeks earlier and agonised in the lower half of the league charts. Aware of the statistics - Mlada Boleslav had never lost at the U Nisy pitch, Uhrin's boys were paper favorites. The only visible effect was that most of the match was taking place in the Liberec half of the pitch. Unfortunately it was without goals, and only Miller from Mlada Boleslav fished the ball out from the net. A series of indecisive defending on the left of the Mlada Boleslav defense culminated in a grounded pass being played across the front of Miller's goal, Keric pushed off Prochazka and the experienced Nezmar had the easy task of making the net wave by the right goalpost - 1:0. Polacek had the biggest opportunity for Mlada Boleslav in the 14th minute, while the score was still goalless, but his effort narrowly missed the upper right corner of the goal. Liberec were not far away from scoring before the break. Goalkeeper Miller boxed out Papousek's corner in the 31st minute. Another of Papousek's centred crosses followed, and dropped at the back post where an unguarded and unprepared Vulin saw his weak effort on goal saved on the line by the Boleslav keeper. Mlada Boleslav continued to control the ball in the second half, but the players could not manage to work themselves into shooting positions after overplaying the ball in wide positions. Moreover, Liberec were quick to break up the play with strong and often foul play. Nezmar won an hard ball in the 65th minute before passing to Keric, who steadied and prepared to shoot after some quick interplay firing the ball along the ground past Miller's right hand - 2:0. Unfortunately that was not the end of the story. Keric weaved his way through the defensive line in the 72nd minute, and cut the ball back across the 6-yard box to an unmarked Bosancic who easily tapped the ball into an unguarded net - 3:0. There were to be no further additions to the score-line but the action continued with players from both sides being sent off. Vacha from Liberec was cautioned for a second time in the 73rd minute and consequently sent from the pitch, however Boleslav could not take advantage of the weaker Liberec team. In the second last minute of normal time Rolko was also to leave the pitch prematurely but his dismissal was strange to say the least. After a clash with Puric the referee had instructed the play to continue, but following a hysterical outburst from the Liberec assistant coach Vyslouzil, he interrupted the game and ordered a penalty kick.Before it took place and after a long thinking period, he approached the Boleslav defender and showed him a second yellow card. Thus both the teams finished with ten players, but it was Liberec who were less inclined to worry, happy about the outcome and reversing the loss in Mlada Boleslav in August. Line-up of FK Mladá Boleslav: Miller - Kalina, Rolko, Procházka, Kúdela (42. Djalovič, 62. Opiela) - Mendy, Sylvestre, Rajnoch, Poláček - Kulič, Táborský (46. Chramosta). 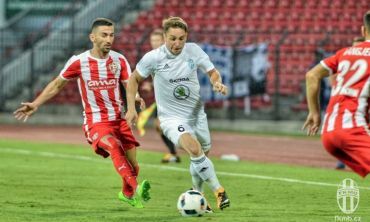 Pecka, Nečas and Šeda were unused substitutes. Line-up of FC Slovan Liberec: Zich - Gebreselassie, Dejmek, Polák, Janů (46. Bosančič)- Frejlach (61.Purič), Papoušek, Vácha, Vulin - Kerič (86. Holeňák), Nezmar. Diviš, Čorič, Krbeček and Uvarenko were unused substitutes.